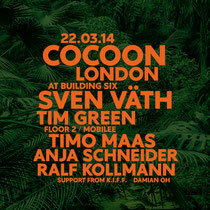 As part of the London Warehouse Events, Sven Vath returns to London tonight for the last instalment of his Cocoon parties in the capital until late 2014. With another big line-up and an extended set from Sven to look forward to, this could be the ideal warm up for the summer season ahead. Anja Schneider will be heading up room 2 as her Mobilee imprint joins the party with Timo Maas and more in toe. Joining Sven in the main room will be Tim Green who has reverberated himself through the realms of house and techno over the past few years. Representing Cocoon in Room 2 will be Timo Maas, whose inspiration from some great clubs around the world has allowed him to create a sound that's direct and gripping, reflecting exactly the mindset of what Cocoon has always been. Flying the flag high for Mobilee are label owners Anja Schneider and Ralf Kollmann, which will be Anja's first performance in London since her recent set at Tobacco Dock on New Year's Day. For more info, check www.londonwarehouseevents.co.uk, to get excited, check the video below of the last party.